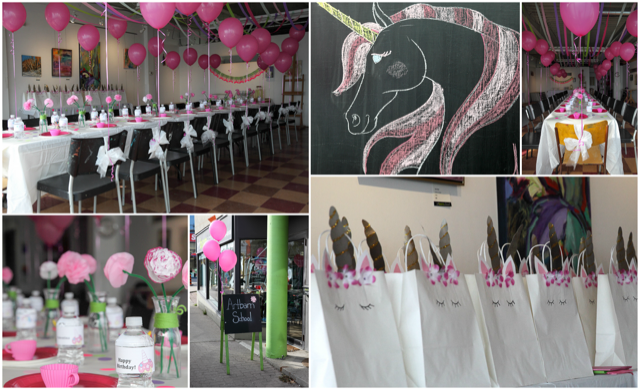 Why not throw your child a custom painting birthday party? Whatever their interest, we can work with you to set up a fun party which includes a unique painting project. At the end of the event, each guest will take home their acrylic masterpiece on a real canvas, popped into a white paper shopping bag that can be decorated to match any theme. 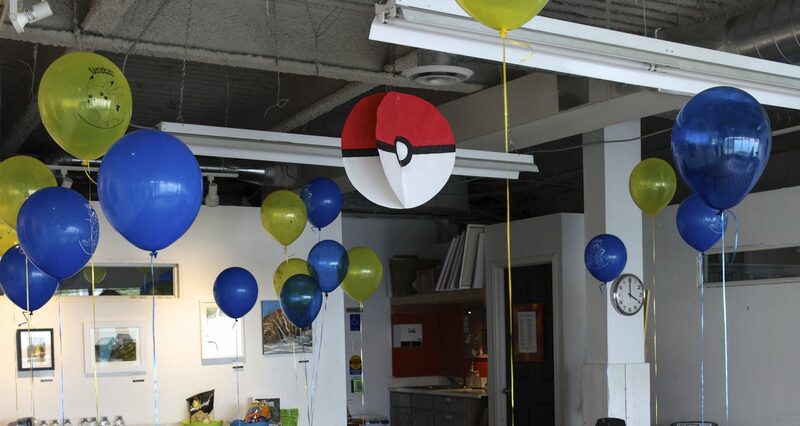 Some of the themes we have worked on before include: Pokemon, princesses, unicorns, dogs, and landscapes. We can help customize the white paper shopping bags too! 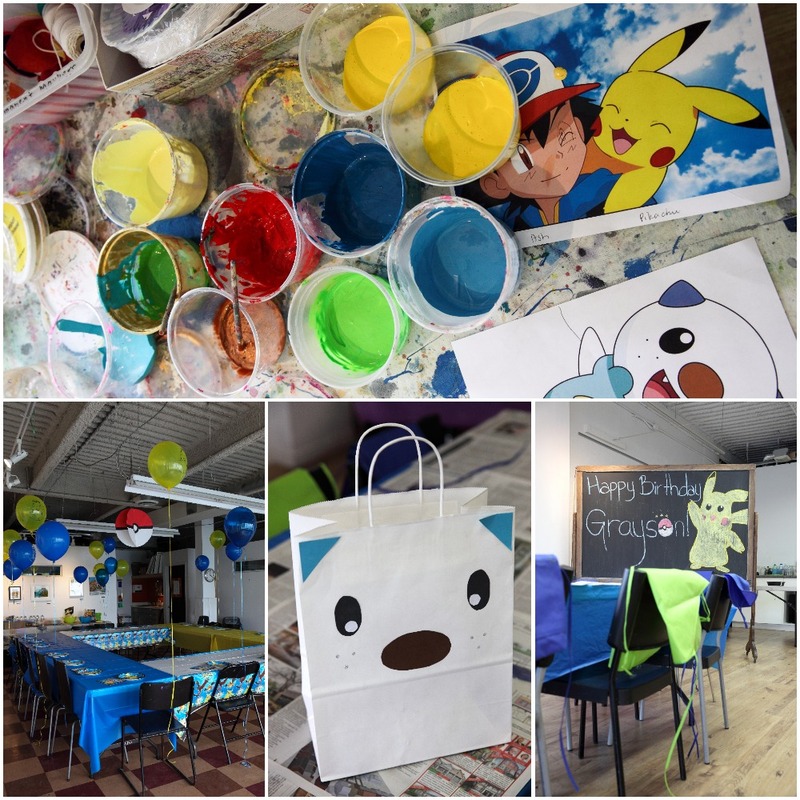 We have worked with party-goers to turn the bags into a favourite Pokemon character, or a glittery rainbow explosion! Add your own loot to the bag and you are done! You will have access to the full 2000 square feet of Artbarn. We set up the West Studio with everything kids need to complete their art projects. The chalk board will be transformed with birthday wishes and a cute picture keeping with the theme. Painting smocks will be provided. The East Studio will be set up for snacks and cake. We ask parents to supply the decorations, but we can help you decorate the space. We also offer button making included in the $30 fee. The parties run for one and a half hours. There will be three specially trained staff on site to guide the painting session, help you set up and serve food, and hand out loot bags. Come up to 15 minutes early to drop off supplies. Pull up beside the school on Oriole Parkway. We will help you unload. We try to think of everything for your birthday girl or boy, so you don’t have to! If there is something we can help with, and we haven’t mentioned it here, we will definitely do our best to get it done!!! “Wonderful! Beautiful party! The kids really enjoyed it!” – T.B. “The kids had a great time; it was an excellent party. Your staff were so helpful and nice, too.” – A.L. “The party was wonderful! The Artbarn staff did a fantastic job — they were extremely helpful and accommodating and made the party a real success. Our daughter and her guests all had a great time and went home with some beautiful pieces of art!” – M.R. “I just wanted you to know how great the birthday party was at Art Barn, yesterday. It seemed to be loved by parents and kids alike!” – J.A. “Please pass on my thanks and appreciation to your team for facilitating such a terrific party for my son. You may be amused to know that when I asked him if he enjoyed his party, he said, “no.” Me (slightly horrified and appalled): “why not?” Son: “it was too short!” – A.L. “The party was fantastic!!!! So organized, easy for everyone, great painting/ keepsake to take home. We were incredibly happy and would definitely recommend to anyone. Can’t say enough. And your staff just made the whole thing go so smoothly” – L.W. $30 per child (includes loot bag, canvas, and button). A minimum of 12 children – deposit of 50% required upon booking.